"The reason for this separation is to better understand ourselves and the qualities we need in a partner and for our marriage. We remain best friends and responsible parents to our daughter and we still love each other deeply. As we go though this process we are determined to use kindness and understanding to get through this together." "We are comfortable with the boundaries that we have established for each other during this separation and we hope that our friends, family, fans and the media also show us respect, dignity, understanding and love at this time as well." Las fuentes afirman que llevaban separados meses, desde antes del rodaje de Scream 4. Arquette y Cox se conocieron durante el rodaje de Scream, en 1996, eran novios en 1997, en el rodaje de Scream 2, y se casaron poco antes de comenzar a filmar Scream 3, en junio de 1999. 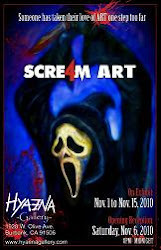 Sources claim that they had separated months, since before the shooting of Scream 4. Cox and Arquette met on the set of Scream, in 1996, were engaged in 1997, on the set of Scream 2, and they married shortly before filming Scream 3, June 1999.